This unique macaque is the only monkey species found outside Asia and the only one native to parts of Europe. 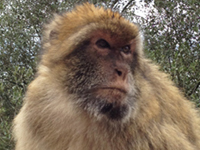 Historically widespread throughout Northern Africa, the Barbary macaque now exists only in patches of northern Morocco and Algeria’s forest, is regionally extinct from Tunisia, and was introduced in Gibraltar (UK). The species’ isolated populations are limited to fragmented areas in the Moroccan and Algerian mountains. Habitat loss is a primary threat and, despite national bans in Morocco and Algeria, significant illegal trade is also a major factor, with an estimated 200 animals illegally taken from the wild annually in Morocco. The monkeys supply European pet markets and are used for photo props, where they can fetch upwards of €2,000 in the EU. The Barbary macaque is the most seized CITES mammal in the EU, accounting for 25% of live mammal seizures. 72 seizures were reported by EU authorities between 1997-2013. Recent records of illegal trade, e.g. in Serbia, Russia and Ukraine, indicate the rise of new markets for this species. Records of 545 requests for homing of seized or surrendered Barbary macaques were received 2001-2015, mostly in France, Belgium and Spain. Tragically, if habitat loss and excessive illegal capture of infants continues at the current rate, one Moroccan population will disappear within 15-20 years. The species is red Listed as endangered on The International Union for Conservation of Nature (IUCN 2008). Overall population of the species plummeted by over 50% over three generations (24 years), which is ongoing. Only 6,500-9,100 remaining with populations which are severely divided. A population decline of 50-80% over last 30 years has been seen in one Moroccan population which was considered a stronghold of the species. Meets criteria for Appendix I - marked past population decline that is ongoing; population severely divided; illegal international trade is having a detrimental impact on species’ status.